A qualified electrician must repair any major electrical fault in an electrical installation, including wiring and replacing fittings. This guide is only to establish whether the fault is caused by an appliance, and to narrow the fault down to a specific area so you are not left completely without electricity. That being said, there are some easy tasks that you can attempt yourself to help diagnose a fault, reducing the time an electrician is onsite and therefore saving you money! Before undertaking any task in this guide any appliance to be worked on should be switched off at the wall and also unplugged to prevent electric shock and possible electrocution. Locate your switchboard. This where the power to your premises is isolated. 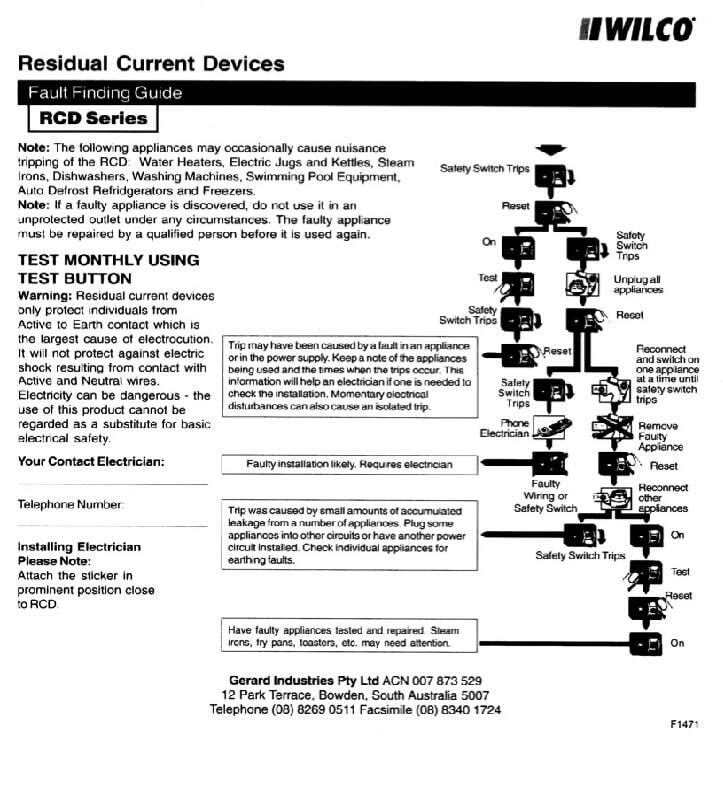 It is good to know the location of your switchboard, and not only for the purpose of this guide. If the problem you are experiencing is loss of power or lights, open the switchboard. All of the sub circuits should be labelled. In the rare event they are not, don’t worry; it is still easy to identify the faulty circuit, as the position of the small lever on the particular circuit will be in the ‘off’ position. If you have fuses installed it is recommended that these are changed to circuit breakers or RCD’s to meet current electrical standards and for peace of mind and safety. The next step is to try and reset the tripped trip switch. If it resets without an issue nothing more needs to be done other than monitoring when and what is being used if it trips again at a later date. If it does not reset, please continue reading. If the problem was the lights, try turning on sets of lights and fans individually until the circuit trips. By doing this you are narrowing down the location of the fault in the circuit. To repair a fault of this nature a qualified electrician is required. However give yourself a pat on the back as you have most likely saved yourself hundreds off your bill from the electrician in labour charges. If the problem was the power points, try plugging in all your appliances one at a time until the faulty appliance is identified. You now know the source of your problem! Simply leave the faulty appliance unplugged and have it repaired by a qualified electrician. This is where Florance Electrical Darwin comes in, simply call us and you can relax knowing the problem is being fixed by qualified professionals. We will also perform our free safety check whilst onsite, giving you peace of mind knowing premises passes electrical safety checks and complies with current standards.